Escaping from Paganism or How a Roman Catholic Can Be Saved? The title to this book is provocative and labels Roman Catholicism as Pagan and not Christian. Am I trying to pick on Roman Catholics? See Preface below. 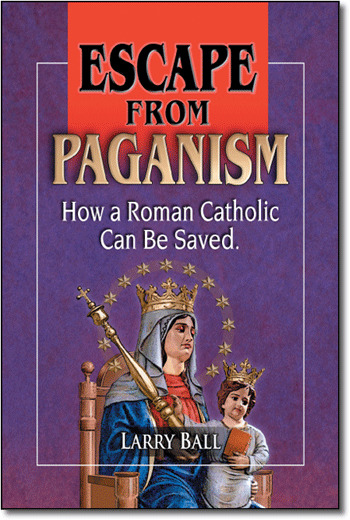 Escape From Paganism or How a Roman Catholic Can Be Saved? This is a rather unfriendly, provocative title, isn't it? Well, it can be taken that way but it is not the purpose of the book. Pope Benedict stated that the only way to salvation is through the Roman Church. In other words, all Protestants are damned. Is his statement "unfriendly" to the Protestants? In this book, the author, Larry Ball, sets out to prove the Roman Church is without the presence of the Living God. At the same time, the book answers the more important question "What is Christianity?" and compares Roman Church teachings and practices against Biblical teaching. There are 77 chapters in Escape From Paganism, with ten chapters shared in this Web site. These chapters are all very short. They are "word bites," similar to "sound bites"
The title is provocative and labels Roman Catholicism as Pagan and not Christian. Am I trying to pick on Roman Catholics? Why did I write this book? Go back with me to the spring of 1971. I was an agnostic making my own way and did not need God, whom I really did not think existed anyway. Think about that word “agnostic.” It is a compound word that means without knowledge. In the sense that I have used it, it means without knowledge of God. When you think about being without knowledge of God, you have to think of the condition, “atheoi.” What is this? It is the Greek word from which we derive the word “atheist.” It means to be without God. To be an agnostic is to be an atheist, because if you are without knowledge of Him, you are without Him. So what has this to do with Roman Catholicism? Just this, the Roman Church is atheistic. Atheistic? Do they not believe in the God of the Bible, His Son, Jesus Christ and the Holy Spirit, the Triune God? Now we are at the purpose of this book. This book will prove with a resounding no; they do not believe in the God of the Bible or His Son the Lord Jesus Christ. As you will see, the Roman Church does not believe in the Bible as the revelation of God. They add to it “Tradition and the Magisterium” of the Church. In fact, when you look at their rituals and catechism (which this book covers) you will see that they believe in many gods and in their catechism damns the real God. If you are Roman Catholic, you are, then, agnostic and atheist. This is not meant as a slur upon you or any Roman Catholic. It is merely stating that you are in the same condition I was in, back in 1971. I was without the knowledge of and the companionship of the Living God. This book is meant as a rescue call. Back in 1971, I received a rescue call. A friend talked to me about Christ and my need for Him as my Savior. I insulted him but he kept it up for six months. He finally asked me if I had ever read the Bible. I told him no, I had not, but often thought I should so I could show people like him how silly it was. He challenged me to read the Bible, so I bought one and started reading at Genesis 1 (he had recommended the Gospel of John) and read to Genesis 25. By this point I had become well acquainted with a man described as a friend of God, Abraham. But Abraham was a sinner, a terrible sinner in my mind, but so was I. God, though, saved Abraham and declared him righteous. By this point I was under the conviction of the Holy Spirit. I knew that in my own way, I was as big a sinner as was Abraham. If God could save Abraham, maybe He would save me. Finally, in my office one day, I closed the door and took out a tract that had a prayer in it. Before I said it I asked God to help me in my unbelief. Then I prayed to receive Christ as my Savior. My life began to change! I had been rescued from the path to Hell and was given eternal life. Assured eternal life! No loss of salvation each time I committed a sin as I was born into God’s family and would be disciplined by Him from within. No need to confess to a priest my sins as they were continually being confessed through the Holy Spirit. No need to sacrifice Christ over and over again in the mass as His one sacrifice on the cross was sufficient – according to His own words. He said “it is over.” No purgatory was needed to clean me up, as the Holy Spirit within is perfecting me. When I die, I will be perfect and present with the Lord — not because of what I do to clean up my act, but because of what God is doing to clean me up from the inside out. We will look at all of these issues and more within this book. I have used the Roman Catechism of Trent, which was reaffirmed by Vatican II. Many other historical sources, all documented in the book, were used. I would recommend that you have a Bible handy as you read this book and make sure of what I am stating; it can be eternally important. Salvation for those who are “agnostic/atheistic,” in other words, without knowledge and the companionship of the living God of the Bible, is the purpose of this book. It is possible to know that you are saved and saved forever without end or hiccup. There is an old hymn entitled, Throw Out the Lifeline. Please approach this book with that thought in mind. This book is intended as a lifeline, to provide information for the rescue of those that are perishing. What Is the Imagery We See Today? LORENZAGO DI CADORE, Italy. Pope Benedict XVI has reasserted the universal primacy of the Roman Catholic Church, approving a document released Tuesday that says Orthodox churches were defective and that other Christian denominations were not true churches. In the new document and an accompanying commentary, which were released as the pope vacations here in Italy’s Dolomite Mountains, the Vatican repeated that position. “Christ ‘established here on earth’ only one church,” the document said. The other communities “cannot be called ‘churches’ in the proper sense” because they do not have apostolic succession — the ability to trace their bishops back to Christ’s original apostles. With this news release, Pope Benedict XVI, depicts a little of the Roman Catholic World View. What happens to you when you die? Will you go to heaven or hell? The Pope, in the news release above, clearly states that if you are not a Roman Catholic your destination is hell. What authority does the Pope have to make this statement? It is called “Papal primacy.” Papal primacy was established at the Council of Florence. This council was held at Florence (Firenze), Italy between the years 1431-35 AD. Now when Jesus came into the parts of Caesarea Philippi, he asked his disciples, saying, Who do men say that the Son of man is? And they said, Some say John the Baptist; some, Elijah; and others, Jeremiah, or one of the prophets. He saith unto them, But who say ye that I am? And Simon Peter answered and said, Thou art the Christ, the Son of the living God. And Jesus answered and said unto him, Blessed art thou, Simon Bar-Jonah: for flesh and blood hath not revealed it unto thee, but my Father who is in heaven. And I also say unto thee, that thou art Peter, and upon this rock I will build my church; and the gates of Hades shall not prevail against it. I will give unto thee the keys of the kingdom of heaven: and whatsoever thou shalt bind on earth shall be bound in heaven; and whatsoever thou shalt loose on earth shall be loosed in heaven. The Roman Church claims direct succession for the Pope from the Apostle Peter and all the powers that they claim Christ gave to Peter in the statement above. In this Church of Christ the Roman Pontiff, as the successor of Peter, to whom Christ entrusted the care of his sheep and his lambs, has been granted by God supreme, full, immediate and universal power in the care of souls. He is endowed with the primacy of power over all the churches (Vatican Council II, Volume 1, The Conciliar and the Post Conciliar Documents, Austin Flannery, O.P.). The above statement from Vatican II is pretty comprehensive. Since their claim to the primacy of the Pope goes back to the 1400s, let’s look at some historical expressions of this power and then some theological assertions about final authority, which means “who is boss?” Before we do, however, consider the two following definitions. Keeping them in mind will help you understand the Roman Church’s World View. What is papal primacy? Papal primacy is the concept that the bishop of Rome (the pope) is the universal pastor and supreme head of the Catholic Church. He has full, supreme, immediate, and universal jurisdictional authority to govern the church. This means that no bishop, synod, or council of bishops can override his authority. His teaching authority is defined as the doctrine of papal infallibility. His governing authority is contained in papal primacy. You need to understand this “ex cathedra” issue. Anytime the Pope speaks “ex cathedra” they claim the Holy Spirit has hold of him and is dictating what he says. In the addendum of this book is a list of scurrilous popes, murderers, non-celibate men siring illegitimate children, admitted unbelievers, heretics, thieves, and even one pirate. These men and one woman lived sinful lives, but when they sat in the “chair” (ex cathedra), the Holy Spirit supposedly took control and the words of God came forth. This is abominable and a direct attack on the character and person of God. Is the Pope the Supreme Ruler of the World? Who is this God who has spoken? What has He said? Where do I learn what He has said? To quote an old adage: “out of sight, is out of mind,” but is God truly out of sight? Humanity generally ignores God and His Words are viewed with disbelief. But disbelief will only get us in trouble. God not only thinks He is boss, but is! What is your concept of “God-ness.” My computer has one. Just now, when I typed “Godness,” spell-checker changed the word to “goodness.” That is good, because God’s goodness is great. There is no “badness” or evil in God, but how do we know this? Man is capable of defining or understanding anything that his “senses” can reveal to him. We humans need to see, taste, touch, smell, or hear something to comprehend it. We are in darkness regarding anything that exists beyond our natural human abilities to discern. Man has one other “sense,” however, which makes some think we are reaching beyond our basic senses for understanding. This other “sense” is our imagination or “make believe.” In and of our own ability, we cannot see, touch, smell, hear or taste anything beyond our real time or physical world. What does this have to do with God speaking? If there is a God, and if this God wants us to know anything about Him, then God must reveal Himself to man. Why? God must reveal Himself to man because if He is God, He has to exist above the order, or “laws” of the physical world, which He created. We can infer from the order of the physical realm that God must exist, that He must be great and all powerful, but little else is discernible. God’s existence is revealed by His creation, our physical realm; He is beyond our sensible ability to fully comprehend by our senses, but He has spoken. He has spoken so He could reveal His purpose for creation and His purpose for man. His purpose is His world view. Notice also that the next time anyone sees Him on earth that He will come again in the same way that He left. He does not appear in visions, apparitions, or transubstantiation. He is not there in the elements of the eucharist/mass. Chapter 2 of Acts reports on the empowerment of the disciples by the Holy Spirit. A great crowd had gathered outside the Temple in Jerusalem. The disciples were there and spoke to the crowd, with Peter having the principle message. The chapter reports how all the people were of different nationalities and tongues, yet they heard the message in their own tongue because the Holy Spirit caused the disciples to speak to them in their own language. It states that about 3,000 souls were added that day. Added? Added to what? The mystery! What is the mystery? The Spirit of the Lord is upon me, because he anointed me to preach good tidings to the poor: He hath sent me to proclaim release to the captives, And recovering of sight to the blind, To set at liberty them that are bruised, To proclaim the acceptable year of the Lord (Luke 4:18-19 ASV, quoting from Isaiah 61). Here is the “captivity” that Christ will lead captive. It is the oppressed and blind.We are not speaking in the sense of the politically oppressed or physically blind, but those who are captive to death and sin. Liberty is proclaimed to us, through the mystery. What is the mystery? Israel stumbled! It stumbled and it has, temporarily been set aside. The Gentiles have been grafted in. Israel rejected their Messiah (King) that week He rode into Jerusalem on the foal of the donkey. Their rejection resulted in the crucifixion of Christ, which was the atonement for our sin. Therefore, the Jews’ rejection of Him as their Messiah resulted in the reconciliation of the world to God (Romans 11:15). That the Gentiles are fellow-heirs, and fellow-members of the body, and fellow-partakers of the promise in Christ Jesus through the gospel (Ephesians 3:6 ASV). And to make all men see what is the dispensation of the mystery which for ages hath been hid in God who created all things To the intent that now unto the principalities and the powers in the heavenly places might be made known through the church the manifold wisdom of God, according to the eternal purpose which he purposed in Christ Jesus our Lord (Ephesians 3:9-11 ASV). The Church, comprised of all peoples and nations, is the mystery now revealed. Though, this is but the bare description. The Church is the Body of Christ. All of those who belong are members, parts, of that body (see Ephesians 5:23-25). Let’s examine the structure of Christ’s Church, His Body. Here is the “captivity” that Christ will lead captive. It is the oppressed and blind. We are not speaking in the sense of the politically oppressed or physically blind, but those who are captive to death and sin. Liberty is proclaimed to us, through the mystery. Did The Orthodox Fathers Sanction Tradition Over Scripture? The Roman Church claims that the Orthodox Fathers of the Church were unanimous in supporting Tradition. Were they? At the Council of Trent they attempted to destroy and prohibit any writings or teachings that would conflict with the “truth” propounded and taught by the church. They established the Index Expurgatorius. This was a list of books and passages that the Roman Church faithful were prohibited from reading. The Index was established in 1562 at the Council of Trent and retired in 1966. The writers of the first six centuries are commonly embraced in the list of the fathers. Those who were contemporary with the apostles are called apostolical fathers. These are Barnabas, Clement of Rome, Hermas, Ignatius, and Polycarp. They were all natives of the East, except Clement, and wrote in Greek. The principal Greek writers who succeeded the apostolical fathers were Justin Martyr and Irenaeus. 1. Ignatius some say that he was about seven years old when Christ preached. He was called Theosophorus and was made Bishop of Antioch in 70 AD. He was martyred in 107 AD. He exhorted his followers to “Hold firmly to the tradition delivered by the Apostles, which had already been committed to writing, which was necessary for their preservation.” In other words, the “paradosis” tradition, was now set down on paper and was now Scripture. But notice that Irenaeus states that “had they left us no Scriptures, then we would have had to revert to Tradition. Remember, the Roman Church has declared the orthodox Fathers to be united on the issue of Tradition equaling that of Scripture. Further, they like to quote Irenaeus in support of that doctrine.We see here that they have lied. But what is new and different about this? 3. Tertullian, originally of Africa, was a Carthaginian, prebyter of Carthage, and a Latin writer. He flourished under the emperors Severus and Caracalla, from the year 194 until toward the year 216. He died about AD 220. In a disputation with Gnostic heretics, he made the following statement:“ Whether all things were made of any subject matter, I have as yet to read nowhere. Let the scroll of Hermogenes show that it is written; if it is not written, let them fear the curse allotted to such as add or diminish.” He is, of course, referring to the curse of God for adding or subtracting from His word (see Deuteronomy 4:2 and Revelation 22:18). To these words Cardinal Bellarmine, writing at the end of the 16th Century stated: ‘Origen speaks of the hardest questions, on which, for the most part Traditions do not treat.” Bellarmine was a Roman Church apologist writing just a few years after the Council of Trent where the teaching of the church was given superiority and Tradition was given equality to the Scriptures. As we see, the Church Fathers’ statements do not agree with Trent’s lies. We could continue with Cyprian, Hippolatus, Eusebius Pamphilus, Athanasias, St. Ambrose, Hilary, Gregory Nyassen, Chrysostrum, and others. All embraced the authority, supremacy and inerrancy of Scripture. It is the only path to the truth of Jesus Christ and therefore the only path to saving faith. Are you not curious as to why the Roman Church through false teaching and black magic sacraments prevents you from coming to your own interpretation of Scripture? Why do you suppose that they demand you believe only what they teach and not what you read? Just who is their master? It is not Christ, it is not God, who is left? Remember the demon-possessed serpent in the garden with Adam and Eve? He turned them away from the Word of God, and thereby brought the whole human race into sin and death when Adam rebelled against that Word. Think about it. What you have read in this book and what you will read, is incontrovertible proof that the Roman Church is built and sustained by lies. Who is the father of lies? Ye are of your father the devil, and the lusts of your father it is your will to do. He was a murderer from the beginning, and standeth not in the truth, because there is no truth in him. When he speaketh a lie, he speaketh of his own: for he is a liar, and the father thereof (John 8:44 ASV). Does The Roman Church Have Sole Authority For Interpreting Scripture? The Virgin Mary or Goddess Myrionymus, (Ishtar) Queen of Heaven, The Woman with a Thousand Names? What Did Christ Say About Mary’s Role? When did the idea of Mary being intercessor, mediatrix, and advocate originate? It appears to have originated in the eighth century from a story written by Paul the Deacon, a monk at Monte Cassino in Italy. The story was titled The Legend of Theophilus. The story is a tad far fetched but Theophilus was a real person. Our hero was named Bishop of Adana, who lived in what is now the country of Turkey. He declined out of humility and was “unfairly” replaced by another. Mr. Theophilus became angry and contacted the Devil, making a contract to serve him. Theophilus soon wised up and knew that he had made a terrible mistake. He fasted and prayed. He particularly prayed to Mary. She interceded and obtained both the absolution of his sin and the return of the contract he had entered into with the Devil. From this one fictional story from the eighth century comes the teaching that Mary is our mediator. With that story in mind, you might ask where “Mariology” came from. It is also fiction, pure fiction. Here is some “source” information. For the facts, themselves, it is necessary, if one wishes to add anything to the gospel narrative, to gather from early Christian literature, evidences of diverse value and not seldom of doubtful value, from which may be adduced, occasionally facts, but more frequently merely conjectures and probabilities. (Page v, Author’s Preface, Saint Mary the Virgin, Rene-Marie de la Broise. Translated by Harold Gidney; Duckworth and Co., London, 1906). Mr. de la Broise goes on to categorize three aspects of reaching the truth about Mary. 1. The historical account of the events of her life. The Gospels and other books of Holy Scripture. Accounts handed down by the Fathers and early church historians (subject to embellishments, of course). 2. It is necessary to give some idea of the mind of Mary and of her inner life. (de la Broise admits this involves a certain amount of conjecture.) This is pure divination! Of course any Tarot Card reader could do it. 3. The part assigned to Mary in the divine scheme of the incarnation and redemption must be set forth. As “Mother of God” she is associated with all the “mysteries” of the Incarnate Word. “If one should be tempted to find exaggeration in all the great things the Fathers of the Church and the saints have said of Mary, it must be called to mind that her motherhood is the source and measure of all her privileges and supremacy. We can know all of this by the infallible teaching of the Church. (Saint Mary, the Virgin; by de la Broise, p. viii-ix). A celebrated divine has made the remark that, though some persons wonder that the Evangelists are silent on the parents of the Blessed Virgin, and have left tradition to record what we know respecting them, yet was this arranged with an especial design by the providence of God. (The Immaculate Conception of the Mother of God, by The Right Rev. Bishop Ullathorne; Richardson and Son, London, 1865. p. 105). Tradition! We can know these things through tradition! One can see why the “divines” at the Council of Trent fought so hard to have Tradition and the Pope’s Words on par with the Scriptures. Without Tradition and the Pope’s word (the infallible teaching of the Church) their whole system folds. Mary’s Dominion in Heaven, or is it Domineering Heaven? See what is in store for us if we do “find” the way. And I saw a new heaven and a new earth: for the first heaven and the first earth are passed away; and the sea is no more. And I saw the holy city, new Jerusalem, coming down out of heaven from God, made ready as a bride adorned for her husband. And I heard a great voice out of the throne saying, Behold, the tabernacle of God is with men, and he shall dwell with them, and they shall be his peoples, and God himself shall be with them, and be their God: and he shall wipe away every tear from their eyes; and death shall be no more; neither shall there be mourning, nor crying, nor pain, any more: the first things are passed away. And he that sitteth on the throne said, Behold, I make all things new. And he saith, Write: for these words are faithful and true. And he said unto me, They are come to pass. I am the Alpha and the Omega, the beginning and the end. I will give unto him that is athirst of the fountain of the water of life freely. He that overcometh shall inherit these things; and I will be his God, and he shall be my son (Revelation 21:1-7). You see here a new heaven and a new earth, a new Jerusalem, the Holy City, and the “Alpha and Omega, who is the Lord and God, Jesus Christ. You also see an existence for those who inhabit this place that is without pain, mourning, tears, death or anything bad. It is eternal life as life was meant to be – a life of joy, peace, security, vigor, and constantly replenished by the water of life. Can you be one that overcomes and inherit these things? How do we attain to this place? It will not be by the Roman Church’s sacraments, goddesses, or “godlets” (saints), their relics or the images (idols) that represent their god, goddess, and godlets. Dependence upon these things will only destine you for the Lake of Fire. Nor will indulgences or absolution by a priest, bishop, cardinal or pope get you there. The way to the New Jerusalem is through faith in Christ, and faith in Christ alone. Let me say it again: there is nothing that can get you into the new heaven and new earth except faith in the atoning work of Christ. Is the Son of God, the Son of Man, fully God and fully man. All things were made through Him. Is the Second Adam, a new race of mankind without a sin nature. Is our one sacrifice for our sin. Was resurrected from the dead. Is the Head of His church of which believers are all Living Stones and members of His body. Will be King forever on the Throne of David. If thou shalt confess with thy mouth Jesus as Lord, and shalt believe in thy heart that God raised him from the dead, thou shalt be saved: for with the heart man believeth unto righteousness; and with the mouth confession is made unto salvation (Romans 10:9-10 ASV). Remember the news release from the current pope, claiming that the Roman Church is the sole source of salvation. He is wrong! You cannot be saved by the dogma, liturgy, or sacraments of the Roman Church. Believe them and you will find yourself deceived into eternal destruction. Sola Scriptura, Sola Fidae, Sola Christus was the cry of the Protestants in the 16th century. These Latin words mean only Scripture, and only faith. The only source of the truth of God as relates to salvation is the Scriptures, the Word of the Living God. The only path to salvation is faith in the Son of God, Jesus Christ. This faith results in your regeneration, the New Birth, wherein the Spirit of God takes up residence in your life. The New Birth is permanent because you are a new you, born into the family of God, a brother/sister to Christ. You cannot be unborn. From the point of your new birth to the point that God brings you home, you are being sanctified. God, through His Word, and His discipline, will make you perfect. There is absolutely no uncertainty about this. It is God’s will that it will happen. There is no purgatory. If God calls you home, you will be absent from the body, but instantaneously in the presence of the Lord. Think of this – it is blessed assurance! Is this something that you want? Do you want eternal life in the presence of the Lord? You can have it, it is free to you, and the Lord Jesus paid the supreme price for it. I can remember the struggle that I went through. I finally prayed to the Lord and told Him of my struggle. I told Him that what I had been told, what I had read, I wanted, but was having trouble with believing. I had no problem with admitting my sinfulness, just trouble believing that all this was real. So I asked the Lord to help me with my unbelief, and He did. He sent the Holy Spirit into my heart and gave me a new one. As I write this the year is 2008. It was thirty-six years ago that my eternal life began. It was thirty-six years ago that the Lord took control and began to change me. It was thirty-six years ago that I gained the Blessed Hope. What about you? You can have the Blessed Hope. Just tell God that you know you are a sinner, that you know you deserve His punishment for your sin, that you know that the wages of sin is death. Tell Him you do not want to pay that price and wish to cast yourself on the atoning sacrifice of Christ, that you believe Christ died for you and that you want to place your faith in Him. Ask God for help in this. It is between you and Him. You do not need a priest for this. Christ is your high priest and He will intercede for you. The newness of your eternal life begins at the instant of your faith. It is my hope that we meet in heaven as part of that victorious crowd and not the one that shuffles forward for judgment. Appendix: Successors of Peter? Really? All for 19.99GBP, or $35.99USD - at these prices you can pass them out as gifts to all your friends.